Terza rima is a three-line rhyme scheme of Italian origin.. The first line rhymes with the third one. The second line is free and can rhyme with a line in the next strophe. Terza rima occurs in sonnets. Sonnets are often composed of two quatrains and two terza rimas, for example abba abba cdc dcd. This scheme can be found in many Italian, Spanish and Portuguese sonnets. This sonnet by the 16th century Portuguese poet Francisco de Sá de Miranda is a good example. qual é tal coração qu’em vós confia? as aves todas cantavam d’amores. e tudo o mais renova, isto é sem cura! Usually terza rimas are linked to each other making long chain-like sequences. There is an extra line at the end of the sequence. The scheme of rhymes is: aba bcb cdc ded... xyx yzy z. Terza rimas are suitable for long poems. 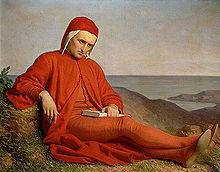 The best known example is The Divine Comedy by Dante Alighieri. Perhaps every child in Italy knows these lines by heart. And this story of both do the townsmen tell. They saw how the blush of the bride increased. 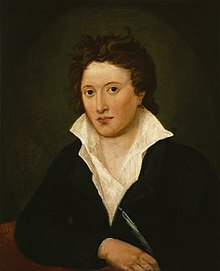 Percy Bysshe Shelley invented a sonnet built of fout terza rimas and a couplet. It rhymes aba bcb cdc ded ee. Shelley used it in Ode to the Western Wind. It consists of five sonnets. Let us look at the first one. American poet Robert Frost in his poem Acquainted with the Night used aba bcb cdc dad aa scheme. Jan Kasprowicz, who translated Shelley's poem into Polish, used this scheme in a work by his own. It is called Cisza wieczorna. (Evening Silence). Another form composed of terza rimas is a villanelle. It is made up of nineteen lines. It rhmymes acording to the scheme aba aba aba aba aba abaa. An example is Do not go gentle into that good night by Welsh poet Dylan Thomas. ↑ Claudio Ciociola, Terza rima at Enciclopedia dell'italiano (in Italian). ↑ Francisco Sá de Miranda, O sol é grande, caem co’a calma as aves at Citador (in Portuguese). ↑ Terza rima at Encyclopaedia Britannica. 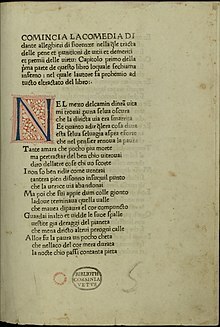 ↑ Dante Alighieri, Divina commedia, Inferno, Canto I at Italian Wikisource (in Italian). ↑ Bernardo de Balbuena, Grandeza mexicana (in Spanish). ↑ See full text at Bartleby.com. ↑ Wiktor Jarosław Darasz, Mały przewodnik po wierszu polskim, Kraków 2003, p. 159-160 (in Polish). ↑ Percy Byshe Shelley, Ode to the West Wind at poetry Foundation. ↑ Robert Frost. Acquainted with the Night at Poets.org. ↑ Jan kasprowicz, Cisza wieczorna at Virtual Library of Polish Literature. ↑ Dylan Thomas, Do not go gentle into that good night at Poets.org. This page was last changed on 4 June 2017, at 23:47.